The media has launched a smear campaign today which is so tired and cynical that it should unite us all in disgust. 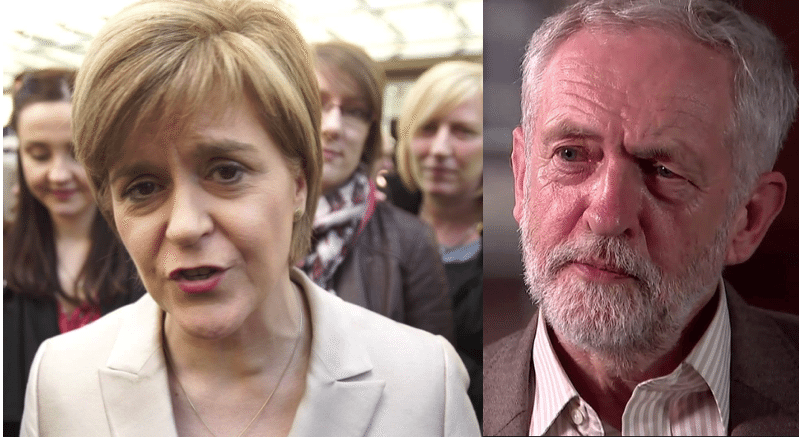 SNP voters, supporters of Scottish independence, Jeremy Corbyn supporters, Greens – all progressive citizens are now facing the same derision and vilification, simply for getting involved in the democratic process. And it has to stop. For Corbyn supporters outside of Scotland, it may feel like the media is uniquely horrid to the Labour leader. In reality, the media-smearing of Corbyn and supporter group Momentum comes from the same playbook used against SNP and pro-independence voters in Scotland in 2014. And judging by the headlines on 13 October, the media appears to have reopened that assault with gusto. 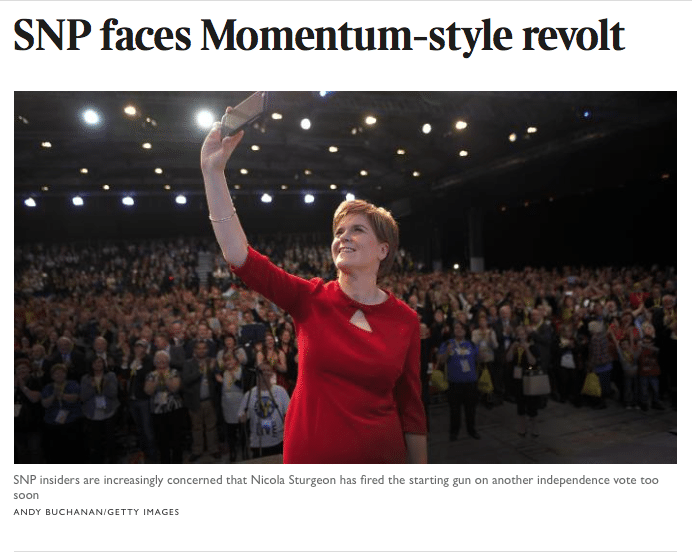 In The Times, Georgie Keate leads with a piece [paywall] entitled SNP faces Momentum-style revolt. From the headline itself, you know you’re going to need to wash your eyes out with bleach afterwards in an effort to clean out all the stupid. To begin with, there was no ‘Momentum revolt’ in Labour. 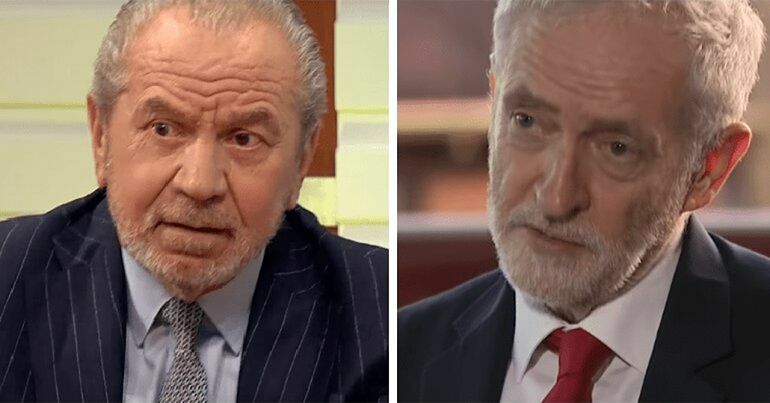 The revolt came from Labour MPs, who mounted a coup against not only the democratically-elected leader of the party, but the half-million-strong membership that elected him. First, the mutinous MPs resigned en masse, believing Corbyn would be forced to resign under the pressure. 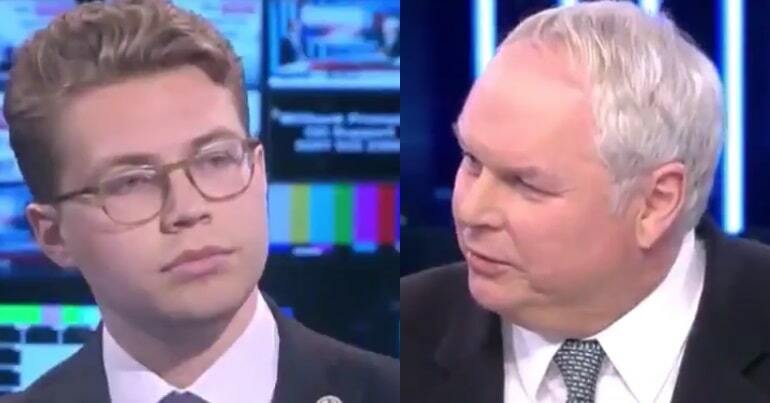 When he didn’t, and instead argued that the membership of the party deserved to vote on whether he remained leader, the MPs went to court in an effort to stop him from standing in the leadership election. When they lost, they began a mass purge of Labour Party members and supporters to stop them voting for Corbyn. There was also a smear campaign in which the media, pundits, celebrities, and Labour MPs mercilessly derided Corbyn and his supporters as mad, bad and dangerous. And when Corbyn finally won the Labour leadership with an even greater landslide than before, his opponents continued to badmouth him at every opportunity. That’s what a revolt looks like. What was Momentum’s role in all this? It backed the Labour Party’s leader, membership and platform. But that didn’t stop the media smearing them with the same relentless, sneering contempt meted out to SNP and independence voters in 2014. ‘Militants’, ‘thugs’, ‘racists’, ‘bigots’, ‘sexists’, ‘antisemites’, even ‘Nazi stormtroopers‘ – almost all the same insults levelled at Scottish voters who supported independence. The latest smear being applied to both Scottish independence and Corbyn supporters is to deride any party conference fringe event hosted by left-wing or pro-independence groups as a ‘rival’ conference, and an act of militancy in and of itself. 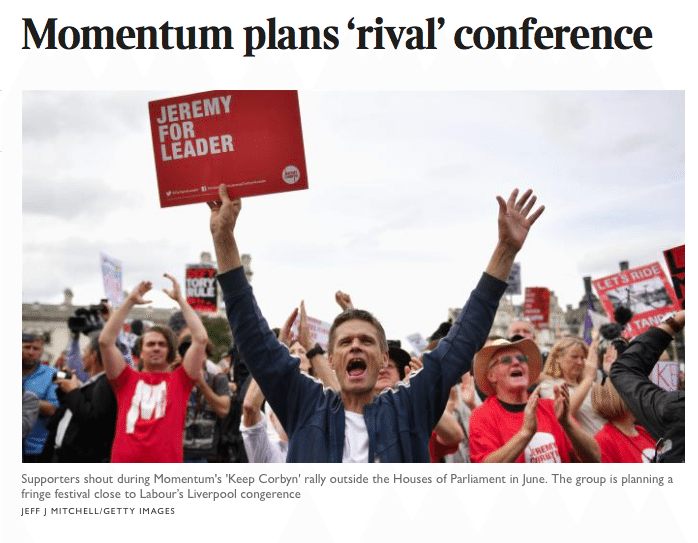 Up to a thousand supporters of Jeremy Corbyn are to descend on Liverpool next month to take part in a “rival” Labour conference provocatively timed to coincide with the official annual gathering of party members. Momentum, the Corbynite pressure group, has announced plans to hold its own four-day fringe festival less than a mile from the main conference venue. One senior party source described the plan as “poisonous and inflammatory” and said that the event, called the World Transformed, would be used to put yet more pressure on Mr Corbyn’s opponents. This despite the fact that Corbyn and his team not only endorsed the event as part of the Labour fringe, but also attended and spoke several times over the course of the conference. Far from being some hotbed of rebellion, it was an exceptional few days of creative thinking, practical solutions, and examples of local communities taking power over their own lives and economies. By contrast, the Fabian Society fringe event saw Labour figures deriding the party leadership, membership, and openly discussing rebellion (despite losing their botched coup just days before). The same eggs are now being thrown at the SNP over a pro-independence fringe event. Nicola Sturgeon faces the first cracks in her party’s unified front during the SNP conference this week as a Momentum-style movement hosts a rival “radical independence” event. What is this wildly mutinous event? Nothing more than a fringe event called IdeaSpace, run by Common Weal – a progressive thinktank with a (well-deserved) solid reputation. When referring to both Momentum and IdeaSpace, Times journalists have got used to employing inflammatory and incendiary language to describe people simply involving themselves in the democratic process. Where regular citizens are exercising their democratic will in a direction The Times doesn’t like, it reports their ticked ballots as tossed petrol bombs, and their political meetings as riotous orgies of discontent. Far from alone, The Times is flanked by the entire Westminster media and its reliable social media commentariat of pundits and celebrities. It is a sickening abuse of power, and a staggering show of disrespect for basic truths. There may be a long and tough road ahead. But the establishment had better believe that building is well underway.